You may be able to pull email interactions from an email queue, but not delete them. Agents can delete emails only if their Virtual Contact CenterA contact center that enables agents to be located in different geographical locations yet managed as if they were located in the same physical location. administrator has configured their Agent ConsoleVirtual Contact Center's browser-based graphical user interface (GUI) used by Agents to manage customer interactions. account to allow deleting pending email interactions from a queue. If your Agent Console account does not have delete permissions, you are not able to see the Delete button or the check boxes to select emails. Permanently deletes the interaction from the queue. 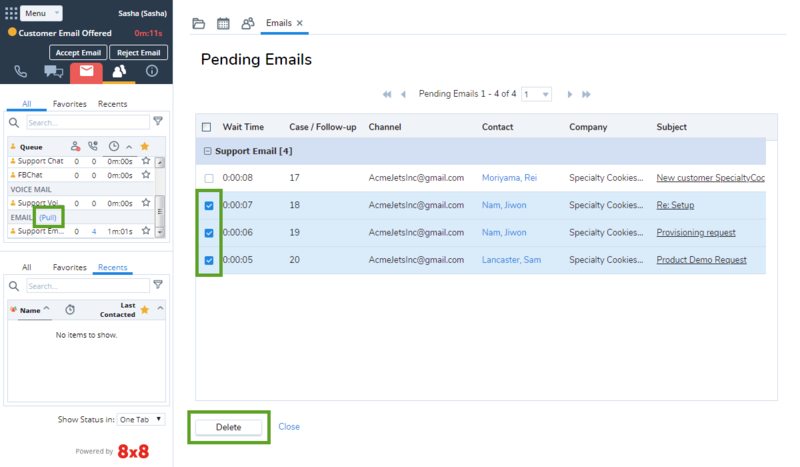 Does not delete the customer record associated with the email from the Local CRM. In Agent Console, set your status to Working Offline. If your status is Available, Agent Console may offer you a new interaction before you can complete pulling email interactions from an email queue. Go to the Status tab in the Control Panel. Click Pull or click on the number of emails. To remove individual email interactions from the queue, select one or more email messages. To remove all email interactions in the list, select the check box in the column heading. Agent Console displays a delete confirmation dialog. In the dialog, click OK to permanently remove the selected email interactions from the queue.